There may be times when you wish to block imports to your schools. This can be done on a per school basis either via your setup for Sloopy or using the block import feature. This feature is only available to those with District Admin accounts. Once logged in, click School Site List in the Toolbox section. From there, click the name of the school you wish to block imports to. 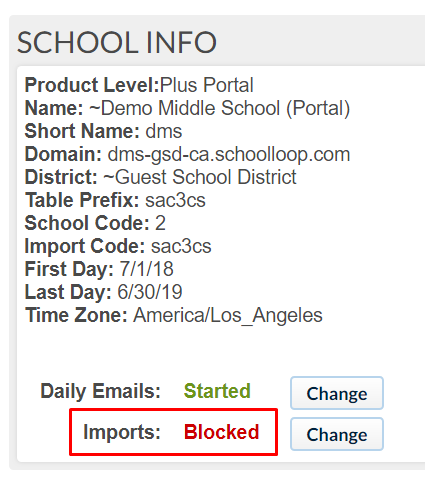 On the school portal page, look for Imports: Allowed in the School Info section. Click Change to block imports for that site. The Imports status is changed to Blocked. Don't forget to change it back to Allowed once you are ready to resume imports.